I love having a batch of homemade hummus on hand and this version is wonderful. Sweet butternut squash pairs really well with fiery harissa and nutty sesame paste. Spread this tasty dip onto a slice of toasted bread and top with a fried egg and hot damn…..you’re ready to conquer your day! This is a great breakfast or simple lunch when paired with a simple green salad. I’ve been putting a fried egg on everything lately because our chickens are laying like gangbusters these days. It’s so wonderful to have fresh eggs again after a month of nothing. I think a good old fashioned frittata is in order so I’ll have to post something soon. 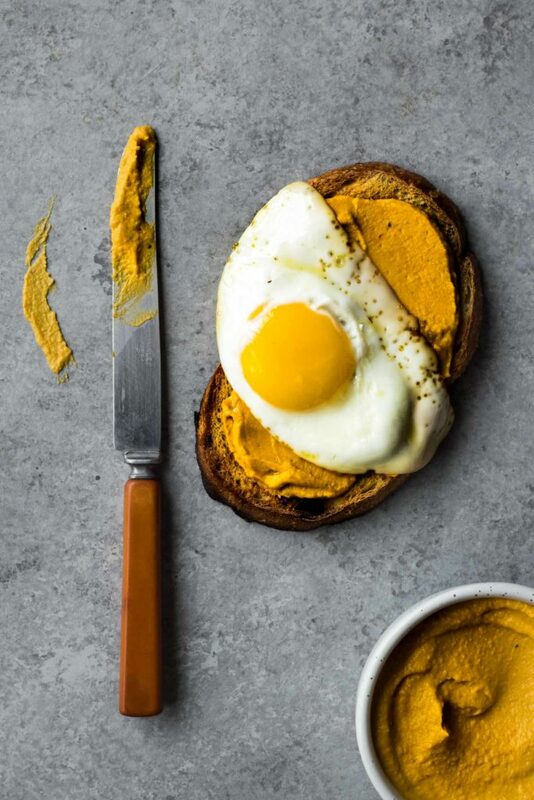 In the meantime, I hope you all enjoy this fried egg and hummus tartine as much as we do. Preheat the oven to 425F. Toss the butternut squash and garlic with a little olive oil to evenly coat the veggies. Spread in a single layer on a rimmed baking sheet and sprinkle with salt and pepper. Roast in the oven until fork tender, about 25-30 minutes. Toss the squash halfway through cooking. Squeeze the garlic from its skin into the bowl of a food processor. Add the butternut squash, tahini, harissa, lemon juice and chickpeas. Whirl away until the mixture becomes smooth and creamy. Add a little warm water, 1 tablespoon at a time, until you reach your desired consistency. Taste for seasonings and adjust as needed. Slice your bread into thick pieces and toast. While your bread is toasting fry up your eggs in a little olive oil or butter until the whites are set and the yokes are still slightly soft. Spread the hummus over each slice of bread and top with the fried egg. Love that hummus! How Long will it keep in the fridge? This is my kinda snacking! What a great recipe and thank you for sharing it! Your roasted eggplant hummus is still my favorite, but this one is a close second! And I finally opened a jar of harissa which has been sitting in my pantry for a while, so now I have extra incentive to browse your harissa recipes (and I should mention that you’ve already converted me to cooking with tahini, which I used to add only to hummus). Thanks for all the great recipes – I cannot wait to see the book!